Dryer Repair in San Diego: Fast, Reliable and Reasonably Priced! 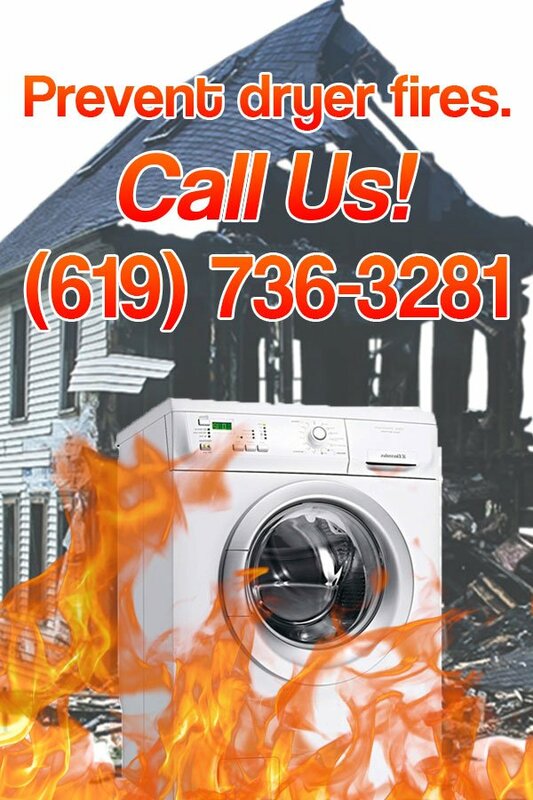 Dryer Vent Professionals of San Diego is a provider of appliance repair for any and all types of dryers. We are a locally owned company with certified technicians who are highly experienced in servicing an extensive number of dryer brands: Bosch, LG, Kenmore, GE washer dryer and Whirlpool dryer to name a few. All this and more at great and reasonable prices! Our goal is to achieve client satisfaction through quality workmanship. We worked hard for our reputation and work even harder to keep it. Gas – These dryers operate on propane or natural gas. The initial cost of gas models can be higher than that of an electric one. But upkeep costs can be much lower making them a more economical option over time. Electric – Electric models cost less up-front compared to its gas operated counterparts. It’s an option for those who don’t have enough space for or just don’t want a gas tank. Drying time for electric ones can take longer compared to gas dryers. Has a drum that isn’t spinning. Defective fuse or heating coils. Malfunctioning motor, roller or idler pulley.